The perfect hideaway for couples Cinder Path is an unusual two storey cottage set high above the High Street with magnificent views out across the roof tops to Staithes harbour and the sea beyond. The cottage is very cosy with storage/electric heaters throughout and has been furnished to reflect the character of the property. It is located on one of the many cliff top paths that surround the village, but is also conveniently just off the main High Street. There is a large double bedroom with large Antique French King Sized Bed with extra deep mattress plus the benefit of a good sized single bedroom at the cottage, which is perfect if you wanted to bring an additional guest. Both the bathroom and kitchen have been recently moderrnised and updated. Free Wi-Fi access. Modern house bathroom with shower over full sized bath, sink, toilet and heated towel rail. We provide bedding, tea towels and oven gloves. Large light and airy living room with sofa, two great armchairs, TV/DVD player, Bluetooth music player and selection of CDs and DVDs. Large velux windows with great views across the rooftops towards Cowbar, the harbour and sea beyond. Recently updated kitchen with electric cooker, microwave and fridge with freezer compartment. Dining table with seating for up to 4 people. Notes on accommodation: Character property which is a perfect retreat for singles and couples alike. Unusual first floor lounge with full height ceiling Velux windows. Free Wi-Fi access. 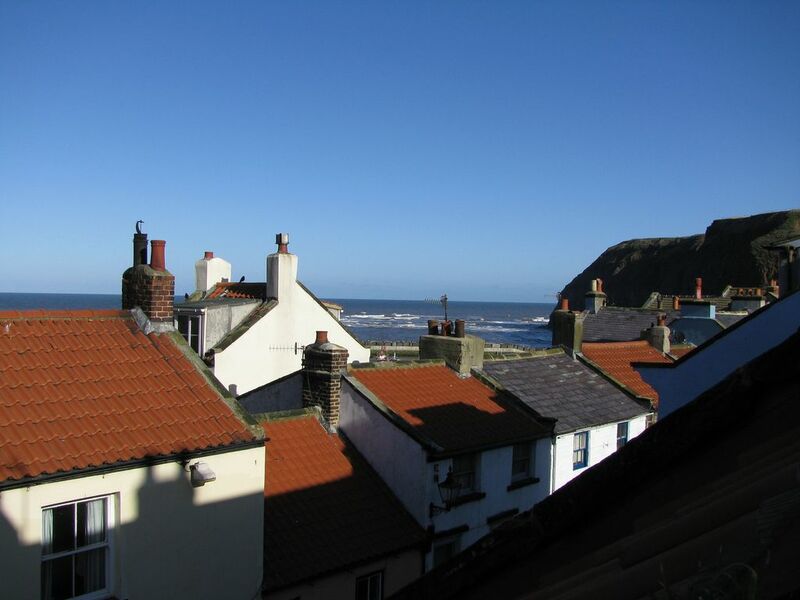 Great location in heart of old Staithes with short walk to the sea front. Staithes has a small harbour beach 200 yards from the properties, Runswick Bay 5 miles - long sandy beach renowned as the best beach combing beach in Britain, Sandsend 7 miles - beautiful long sandy beach with stunning views towards Whitby and very popular with surfers. Staithes is on the main bus route from Middlesbrough to Whitby with hourly services. Stations - Saltburn by the Sea 9 miles, Whitby 9 miles. Airports - Durham Tees Valley 25 miles, Leeds Bradford 75 miles, Newcastle 75 miles. Use of a car is not essential, but recommended. Whitby 9 miles, Saltburn by the Sea 9 miles, North York Moors Railway at Grosmont 11 miles, Scarborough 28 miles, York 45 miles. Two local pubs The George and Cod & Lobster in the village plus The Cleveland Corner bistro, an intimate dining experience. In Dalehouse there is the Fox & Hounds and in Hinderwell the Badger Hounds offering good pub food. All are within 10 minute drive or 30 minute walk if you are feeling energetic! Further afield there are many award winning restaurants in Goldsborough, Sandsend and Whitby.